To be a Pakistan cricket team fan is a romance like no other! They make you fall in love with their passion, talent and drive. However they are vulnerable to their own unpredictability and face challenges all of us can relate to as Pakistanis: lack of funds, nepotism and threats of terrorism. When they falter, it wrenches our heart because it hits so close to home. But when they triumph, all of us feel that we have triumphed and when they raise that trophy it’s for all of us! 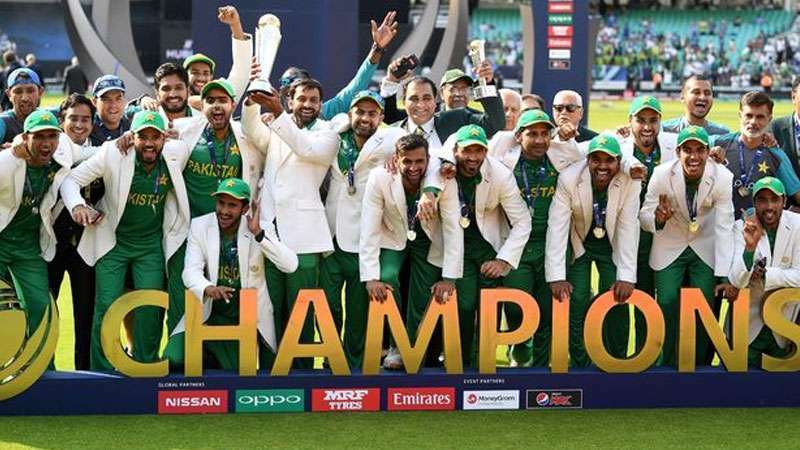 It’s been two days since the team won the Champions Trophy in England however I’m still on a high from that victory being a big Pakistan cricket team fan. I have watched the match highlights on repeat: Fakhar Zaman’s determination as he cruised on, Azhar Ali’s positive demeanor, Sarfaraz Ahmed’s nervous energy as he couldn’t even sit down in the dressing room, Mohammad Amir’s sheer brilliance, Shadab Khan’s confidence as he insisted on the review for Yuvraj’s wicket and Hassan Ali’s excitement as he became the highest wicket taker in the tournament. It was all perfect really. I really couldn’t ask for anything more as a Pakistan cricket team fan and this is the match for which I have endured the pains of 1996, 1999, 2003, 2011 and 2015. As I decided to stay awake for the match, my husband who used to be a big fan but gave up after the 1999 final warned me not to spoil my day. I can’t blame him. It has happened many times since we have been married. He has woken up to find me heart broken and sleep deprived after an epic loss by the Pakistani team. This time however when he woke up in the morning and asked me the score, he couldn’t believe it himself that the team had made 339. His exact comment was: “They don’t even make this much in two matches”. He fumbled with the TV and got the match going on the big screen. I switched off the live streaming from my small phone screen and we were joined by the kids as all of us cheered together watching the match. Pakistan’s obvious dominance in the match for me had a double joy: one as a current fan and then another watching the passion of cricket bloom in my house again. My husband was animated and over joyed surprising me with cricket terms I had never heard him use and my kids were jumping on the bed with each wicket and shouting “Pakistan Zindabad”. Just like 1992 made cricket alive and relevant in Pakistan again, I hope this win does the same for the next generation. One thing was definitely different this time though. Watching the matches as a teenager and than in my 20s, I had found the cricketers handsome cute. Whereas now I found them “masoom” and “bacha” cute. They brought out the maternal instinct in me. I worried for Fakhar Zaman and the immense pressure he faced in an international match. I felt like feeding Hassan Ali to beef him up. And Shadab’s confidence made my heart swell with pride as he called for the review! You go boy! This is the confidence all of us could use in our lives. That was by the way my most favorite moment of the match! I don’t think I saw Miandad’s famous six in Sharjah live on TV. But the incident has been repeated so many times with such vivid details, that it almost feels like I was there in the stadium watching it in person. And then there was the 1992 cricket world cup. Any Pakistani who lived through those Ramazan days has fond memories of watching the day-and-night matches in Pakistan on PTV, listening to the World Cup song on repeat, praying for Pakistan to make it to the semi-finals in the crucial match against New Zealand, Inzimam appearing out of no where and becoming a gum-chewing hero. Watching Imran Khan in his now famous cornered-tiger Tshirt and Wasim Akram grinning as wide as his mouth could stretch when he got two wickets in a row in the final. If encouraged a bit more, people still remember and are not shy to recount total scores, wickets taken and entire winning speech wordings. Such is the passion for the game in a country hungry for Heroes and occasions to celebrate. This Champions Trophy came at just the right time for a Pakistan cricket team fan. Giving us all new heroes and new stories. Watching the streets of Pakistan come alive with celebrations, the welcome the boys are receiving as they reach home and the chants of “Pakistan Zindabad” is exactly what we all needed. And yes, new material for memes for years to come! This buzz is not going away any time soon. So excuse me as I go watch the match highlights again! Dil Dil Pakistan! LOL! I think we are getting ‘Budhi’ now! Yes I agree that now the players are Bacha.. while in our teens the like of IK , Wasim Akram and such were our swooning crushes ;). Pakistan Zindabad!